Have you registered for Memories in the Making? Learn about important new developments for sponsors and view the latest upcoming events for your area. 'Tis the season of Galas and Auctions. Our team was honored to be a part of the Parkinson's Resource of Oregon event last Friday and the Elders In Action event earlier this month- make sure to check out posts and pics on social media. One big event still lies ahead... with the Alzheimer's Association Memories in the Making Art Auction on the 13th. It is wonderful to see how our industry comes together to support the families we serve. For our sponsors- we are hosting a Sponsor Breakfast on Thursday morning at Peace Health Medical Center and Melanie Smith, Social Work Supervisor, Care Management Department will join us and share her insights. Please join us for the Clark County Sponsor Breakfast! 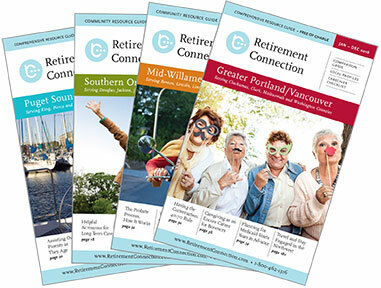 This is an exclusive opportunity for Retirement Connection Sponsors. - Enjoy a free breakfast! Special guest Melanie Smith from Peace Health Medical Center will also be joining us and we hope you will too! 200+ attendance expected for cocktails, seated dinner, art, and silent auction. Proceeds go to support the Alzheimer’s Association Memories in the Making (MIM) Program which works to pair trained art facilitators with those suffering from Alzheimer’s in an effort to help them find comfort, achievement, and accomplishment while living with memory loss. MIM gives people with dementia the ability to paint their thoughts, emotions, and memories so that art becomes their voice.